This week it’s all about finishing up projects that I’ve left in the UFO status for way too long. These cute socks are an example of that! I cast these on in APRIL! I stalled out because in order to finish them I had to undo 1 bind off and re-do it stretchy style. This plus not having done an afterthought heel before left me paralyzed state so to say. I left them so close to completion for months. Well this week I decided enough is enough. I guess I am doing some ‘fall cleaning’. Either way I hauled these out to get er done. And you know what? It wasn’t that bad. The yarn is knit picks felici in minty.. 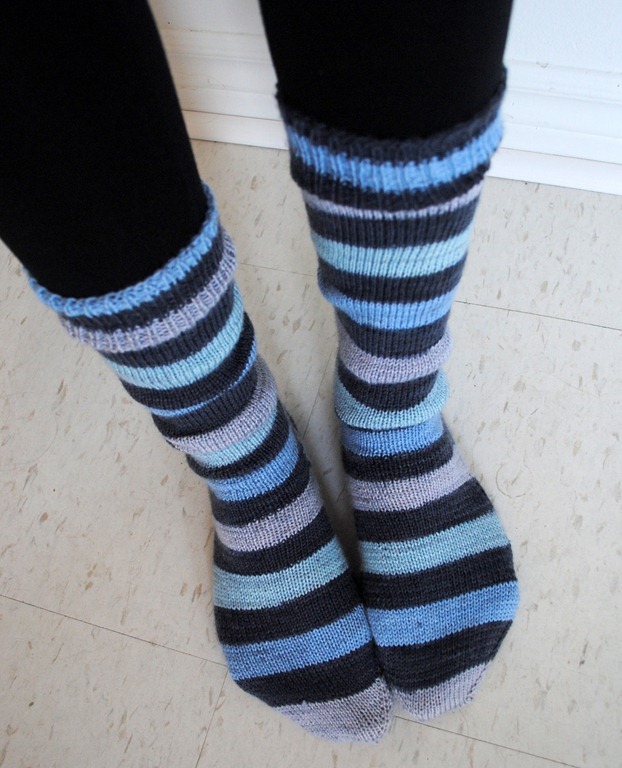 This is my go-to purse sock yarn because I can knit a cool stripe in totally plain colors and they will still look fun! I still have firefighter and hummingbird to knit, and I have a set of tyrian purple socks just waiting to have the ends sewn in later tonight! These socks were knit by casting on 20 stitches for the toe, doing the standard increases, and doing an afterthought heel. I like how they turned out but I want to try a different style of afterthought heel next! i tagged them as a certain pattern on ravelry for ease, but I really just followed my go-to basic toe up sock pattern that’s in my head now. I love them and wore them this a.m., but had to take them off as it’s gone up QUITE a lot to a pleasant 31 Celsius today. Now I’ll wave goodbye for now with my latest nails, done today based on this tutorial. It’s been a while since I’ve linked up anywhere, but i am happy to join in on yarn along today. Reading and Knitting are my two favourite hobbies so I love it when they go hand in hand. This summer I put down the needles in exchange for a book a lot of the time, in fact. Less likely to get hot hands with a book. I’m knitting the offset wraplan baby cardi for one of our best friends bun in the oven. I certainly hope it’s a boy, because these felici colours (sunny day) are turning out a lot less unisex than I was hoping for. What do you think? Pretty boyish right? I may just have to knit an alternate option in Boutique and pass this along to my OTHER friend who just gave birth to a baby boy yesterday. Hmm. 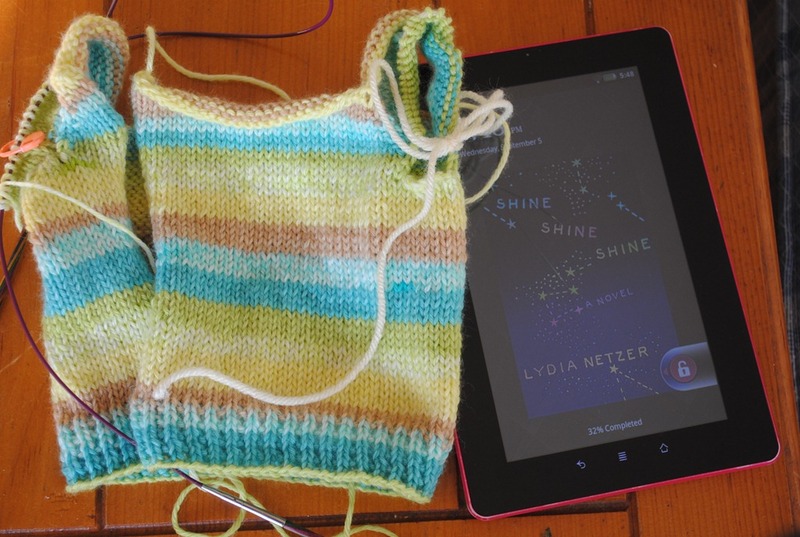 I’m reading shine shine shine by Lydia Netzer. As you can see I’m about 32% into it. Still not sure exactly what the storyline is, but i am enjoying it so far 🙂 I’ll let you know more once I’m further along. In the meantime, you can check it out on amazon if you feel like it.